The Moto 360 in “prototype” form with its screen on made an up-close appearance today, thanks to the official Android Developers blog. 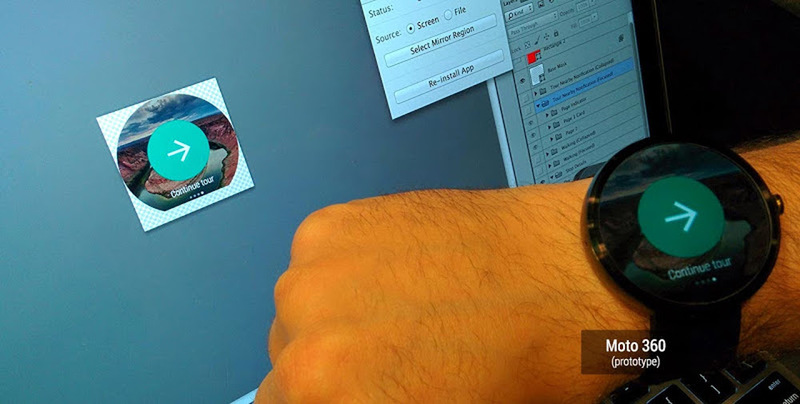 The new image of the 360 comes courtesy of Googlers Roman Nurik and Timothy Jordan, who have the watch on wrist while testing a new Android Wear app in preparation for Google I/O. The image itself doesn’t give us new features or an understanding of its magical charging powers, but we can see how it looks with the display lit up, on someone’s wrist, in a real life situation. Up until now, we had really only seen this device on the wrist of Motorola executives who refused to power it on for media members or in fancy press renders and promotional images. While this is marked as a “prototype,” I don’t think I’m out of line in saying that this thing looks a lot bigger than I originally expected. That’s not to say that it doesn’t look incredibly awesome still, but just keep in mind that this isn’t going to be a small watch, unless this prototype is incredibly old and Moto has worked out some magic to reduce its size. Be prepared for big. In the GIF below, you get another look at it with some movement next to the LG G Watch. Sprint to Host Press Event June 23, Claims "This is Happy Connecting"